In Greek Mythology, Selene goddess of the moon was a Titaness, from the generation which preceded the Olympians. She was represented with a crown in the shape of a half moon on her head. Sometimes her veil was represented in a half moon shape, too. During the day she would bathe in the waters of Oceanus, the river which encircled the world, and at night, after her brother Helios came home, she would go up in the sky, riding in her chariot pulled by white horses or oxen. According to Hesiod, Selene goddess of the moon was the daughter of the Titans Hyperion and Theia, which makes her the sister of Helios (god of the sun) and Eos (goddess of dawn). In the Homeric Hymns, she is considered either the daughter of Hyperion and Euryphaessa, or Pallas' daughter. In later versions she appears as the daughter of Zeus and Latona, but this is a result of her being identified with Artemis. She had many children, with gods and mortals. Her most well known love affair is with the shepherd (or hunter, or prince) Endymion. One night, when travelling in the sky, she saw the handsome Endymion sleeping in a cave on Mount Latmos and she fell madly in love with him. Afraid that him, being a mortal, would become old and then die, she asked Zeus to grant him eternal life, in a perpetual sleep. She would come and visit him at night, and he would dream about holding the goddess in his arms... except it was reality, it was not a dream. Selene and Endymion had 50 daughters, the Menai (months), which represent the 50 months between two Olympic Games. In Phaedra Seneca tells us that, in order to be with Endymion, Selene goddess of the moon would ask her brother, Helios, to ride her chariot at night. But he was not accustomed to the route, he was heavier and he didn't know how to properly ride her chariot, that's why it took him longer than usual to complete the circuit and so nights lasted longer. Selene represented the new moon and the full moon. Whenever there was a lunar eclipse, the ancients thought it was due to the witches, who would cast a spell in order to make the moon disappear, so as to be able to cast their spells. Medea is said to have done this to both Selene and Helios (solar and lunar eclipses) and also Circe. That's why, when Selena saw Medea crying after having lost Jason, she rejoiced for her suffering. 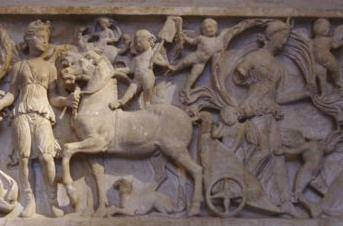 Later, the cult of Selene was replaced with the cult or Artemis. Other names of Selene goddess of moon were: Mene (which simply meant "month") and Phoebe (as she was the sister of Phoebus/Helios). In Roman mythology, she was called Luna and she had a temple on the Aventine Hill and another one on the Palatine Hill. And here, of course, the goddess Luna was replaced by Diana. - by Zeus: Pandeia, who was very lovely, Ersa and Nemea. - by Helios: the Horai (the four seasons) - my guess is this is a kind of metaphor, as the movement of the sun and of the moon determines the seasons. - by herself (or at least with an unknown father): the Nemean lion and the mortal Musaeus, a poet. Here are some images of Selene and Endymion, but I have to tell you that the painters got it all wrong: you'll see that most of them are titled "Diana and Endymion", but we now know that Artemis/Diana replaced Selena (and they were both wearing a half-moon shaped crown). In this painting by Nicolas Poussin (1630) you can see in the background Eos who precedes Helios in his chariot of fire. Diana (i.e. Selene goddess of the moon) has a little Eros on her shoulder, to represent the fact that she was in love. 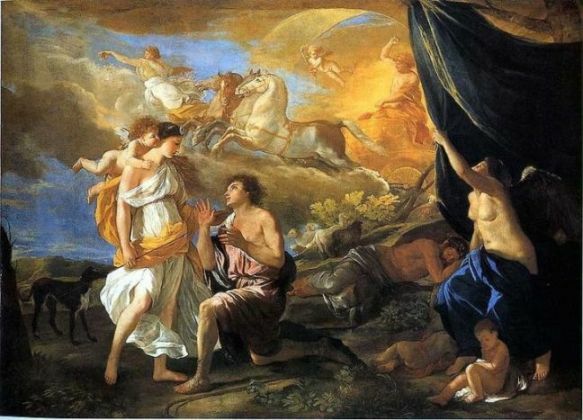 In this painting, we see the so-called "Diana" looking at Endymion from a cloud, which is a representation more adequate for Selene goddess of the moon. After all, Diana was the goddess of hunt, so it would be normal to represent her as hunting together with her pack of dogs. Here is is clear the two characters represented are Selene and Endymion.